Bowmore® is home to the World’s oldest Scotch maturation warehouse, the legendary No.1 VAULTS. Some of the world’s most coveted single malts have been meticulously matured here, steeped in more than 230 years of heritage, matured in the finest casks. 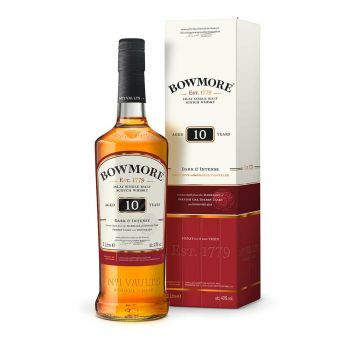 Bowmore’s® 10 years old pushes the boundaries with bold flavour fusions. Spanish oak sherry casks develop spicy notes on our signature peat smoke in an intense marriage of fire and earth. Experience the layered spectrum of baked Seville orange, toasted maple, peat smoked walnuts and sherry.